Does an Ivy League Education Amount to Higher CEO Pay? Indiana University Bloomington, Indiana, U.S.A. The issue of high Chief Executive Officer (CEO) compensation has attracted much attention among researchers in recent years. One study reports that the average CEO salary for an S&P 500 firm in 2006 was $14.8 million. In addition, many Ivy League graduates move on to the executive offices of America's top corporations after having spent over $50,000 per year on tuition. This investigation examines whether having a degree from an Ivy League school is associated with higher CEO compensation. I find that, after controlling for other factors, an Ivy League education is not associated with higher total compensation. Further investigation shows that having an Ivy League degree is associated with marginally higher salary and marginally higher "other" income, but is also associated with significantly lower stock-based compensation. Does an Ivy League Education Amount to Higher CEO Pay? . Sampson-Akpuru, Michael . Lethbridge Undergraduate Research Journal. Volume 3 Number 1. 2008. Over the years, rising CEO compensation has been a controversial topic of interest. The Institute of Policy Studies noted that in 2005, average compensation was $14.8 million, which represents 370 times the average American salary. Such statistics have caused many to question the legitimacy of such compensation and to wonder if CEOs are overpaid. The chief executive officer is the leader of the organization most responsible for the future of the company. CEOs generally have years of education and experience. The average CEO age is 56 years and 90% of all CEOs have at least a Masters Degree. A CEO's education is important because the type and quality of the degree held by a CEO provides credibility and prestige for the company. This paper investigates the relationship between CEO education (whether Ivy League or non-Ivy League) and CEO compensation. This research is important because the average annual tuition for an Ivy-League MBA is $58,000 (145% of the average American salary) while the national MBA average is $40,000. There has been a recent decline in the number of CEOs with Ivy League degrees (Yale Daily News, 2005), suggesting that the value of an Ivy League education has declined with respect to attaining the position of CEO. However, the value of an Ivy League education may manifest itself in other areas, such as higher overall compensation. There has been a great deal of past research on CEO compensation. Many researchers have identified factors influencing CEO compensation such as CEO tenure (Finkelstein, 1988), CEO power in relation to the board (Hambrick and Finkelstein, 1996), company performance (Gomez-Mejia & Welbourne, 1989) and firm size (Marris 1964; Baumol 1967; Williamson 1985). This paper controls for these factors. However, relatively little attention has been paid to understanding the relationship between an Ivy League degree and CEO compensation. This investigation is based on 100 companies randomly selected from the year 2006 Fortune 500 firms. Variables selected include the CEO's educational background, tenure with company, tenure as a CEO, degree level attained, and age. Company performance is proxied by stock returns for 2006 and 2005 as well as return on assets for 2006. I control for the size of the corporation using the book value of total assets. I control for board size, and whether the CEO is also board chair. Before controlling for other factors and influential observations, I find that an Ivy League degree is associated with significantly lower total compensation. However, I find that this unexpected result is driven by a few highly influential observations in my data (including Warren Buffet, who has an Ivy League education with a net worth of $52 billion, but received only $100,000 in total compensation). After controlling for these observations, my results suggest there is no association between an Ivy League education and total compensation. In further analysis, I break total compensation into salary, bonus, stock option gains, 1 and “other 2 .” I find that an Ivy League degree is associated with marginally higher salary and “other” income, but is also associated with significantly lower stock option gains. I also find that CEO compensation is significantly higher for board chairs, and that compensation is significantly increasing in the CEO's age (which is likely a proxy for the experience). This research adds to the debate over CEO compensation. Because I have focused on only the 2006 year, this research also shows how compensation may have been affected by recent media attention on “excessive” CEO compensation. Savvy CEOs likely seek to evade negative media attention by opting to receive much of their compensation in stock option gains, which is indicative of the performance of the company. If the company performs well, the CEO gains and vice versa. In addition, this research suggests the value (or lack thereof) of having an Ivy League education in terms of whether it is associated with higher CEO compensation. A good education is an integral part of becoming an effective CEO. Ivy League education has been correlated to higher measure of cognitive complexity (Wally & Baum, 1994). One study finds that executives from Ivy League schools out perform others. (Maison, 975). Attending an Ivy League institute provides prestige and status. Also, the top management teams are likely to be recruited from Ivy League institutions; therefore, Ivy League schooling provides for contacts and affiliations that may eventually lead to elite corporate positions. Even though the annual Ivy League graduate school tuition is $58,000 (145% of the national average), Ivy League schools provide an advanced academic curriculum to better prepare future CEOs. Company performance is a pivotal determinant for CEO remuneration; thus, executives with Ivy League backgrounds should have better company performance and higher compensation. Accordingly, I hypothesize that Ivy League education is positively correlated to CEO compensation (stated in alternative form). There are several factors identified by prior research that influence CEO compensation. These factors include industry type, corporate governance (board size), CEO power (proxied by the CEO holding the position of board chair), tenure with company, tenure as CEO, degree level, company performance (proxied by 2006 and 2005 stock returns and 2006 return on assets), and company size (proxied by book value of total assets). CEO compensation is a factor of the type of industry the firm competes in. Rajagopalan and Prescott (1999) highlight how the determinants of compensation vary systematically across industries. A company's structural economic characteristics and managerial discretion, which varies across industry, may have an effect on CEO compensation (Finkelstein & Hambrick, 1996). Corporate governance is an important mechanism for controlling for agency costs (Oler, Olson & Skousen, 2006) and determining CEO compensation (Useem, 1980; Roberts, 1959; McGuire et al 1962; Ciscel 1974). The board has the responsibility of assessing senior executives' performance and determining appropriate compensation. (Crystal, 1988; Wesphal & Zajac, 1994; Zahra & Pearce, 1989). A larger board is more likely to hold members with expertise to better evaluate CEO performance and set appropriate remuneration. Holderness and Sheehan (1988) find that executives are paid marginally more when they hold titles of board chair. Also, Finkelstein and Hambrick (1996) report that CEOs who attain a chair position are in greater position to negotiate higher compensations because their title represents more obligations and thus yields to a higher pay. CEOs with longer tenure have greater experience with the firm, and increasing CEO tenure also suggests superior ability (otherwise, the CEO would have dismissed earlier). Finkelstein (1992) notes that CEO power increases as CEO tenure increases; total compensation also increases yearly (Hambrick and D'Aveni, 1990). In other words, the longer the CEO is with the company, the larger the compensation. Bigger firms have greater ability to pay more than smaller firms (Agarwal, 1981). The “corporate growth hypothesis” states that firm size is positively associated with executive compensation. (Ciscel & Carol, 1980). Maximizing firm size may be a worthy goal for which CEOs should be rewarded because larger firms may have grater market power and access to more resources, and are also more complex and demanding (Ungson and Steers, 1984; Henderson and Frederickson, 1993). Results from research on company performance and its relationship to CEO compensation are mixed. Some research reports a direct relationship (Murphy, 1985) while other research reports no relationship (Kerr & Bettis, 1987). But most research suggests that organizational performance positively influences executive earnings (Gomez-Mejia & Welbourne, 1989). Company performance is often proxied by company stock returns (Core & Guay, 2005) and return on assets (Gomez-Mejia, 1992). I select 100 companies at random from Fortune 500 firms for this research. From this source, I obtain the following information: CEO name, company name, CEO tenure with company, years as CEO, percent company stock ownership and total compensation. Total compensation is further broken down to salary, bonus, “other” compensation, and stock option gains. I gather each CEO's degree level and school attended, and whether the CEO was also board chair. Company industry division is determined based on the firm's SIC code. From each of the selected company's annual reports and proxy statements, I obtain the net income from continuing operations, total assets and board size. Using each company's ticker symbol, I obtain stock prices for years 2005 and 2006 from Yahoo finance (which provides prices adjusted for stock splits and dividends). To make the data more amenable to analysis using ordinary least squares (OLS), I take the natural log transformation of all compensation values. I begin with univariate statistical analysis (which does not control for other factors shown to be related to CEO compensation) and show the differences between Ivy and non-Ivy values by mean and median. Next, I use OLS to control for other factors. I check for influential, outlying observations by examining both studentized residuals and “dffits” values following Belsey et al (1980), and use dummy variables to isolate the effects of outliers. Lastly, I break down compensation into its components (salary, bonus, other and stock option gains) to analyze the relationship between each component and Ivy education. 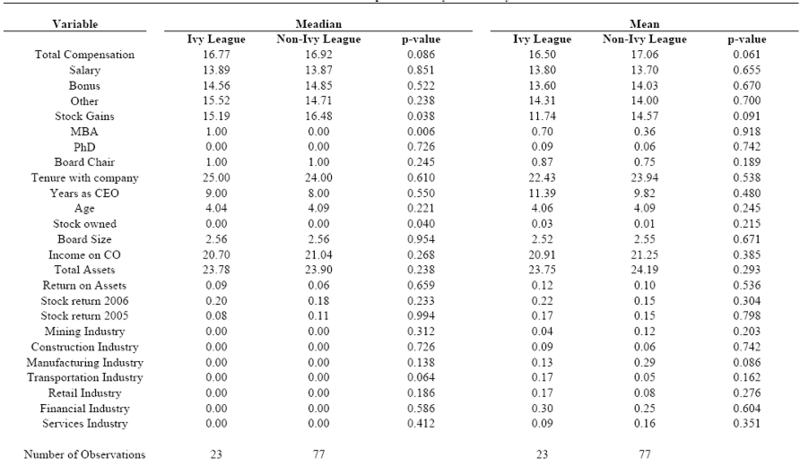 Table 1 shows the medians, means, and Pearson correlations for each variable used in my analysis. P-values for each correlation coefficient are shown below the coefficient. The Ivy League education dummy is negatively correlated with total compensation (?=-0.26, p=0.01), and age is positively (but insignificantly) correlated with total compensation (p=0.07, p=0.50). 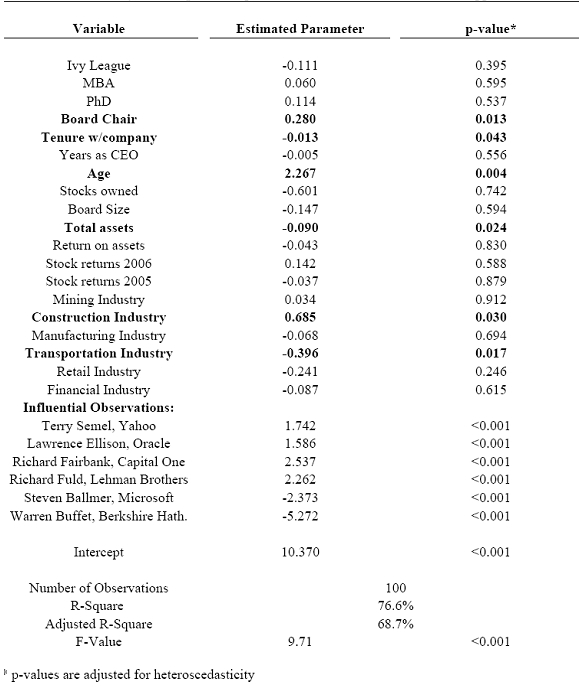 Table 2 shows the univariate comparison of mean and median values between Ivy League and non-Ivy League CEOs. 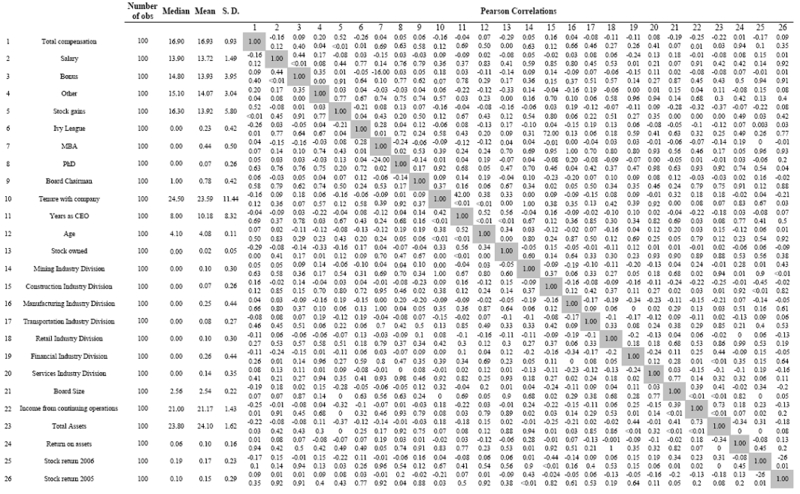 P-values for means reflect a 2-sided t-test and the p-value for medians reflect the Wilcoxon 2-sided test. These results suggest that Ivy League total compensation is marginally lower than non-Ivy League total compensation (16.50 vs. 17.06, p=0.06). This difference is driven mostly by stock option gains with Ivy League CEOs making significantly less than non-Ivy League CEOs. (11.74 vs. 14.57, p=0.091). 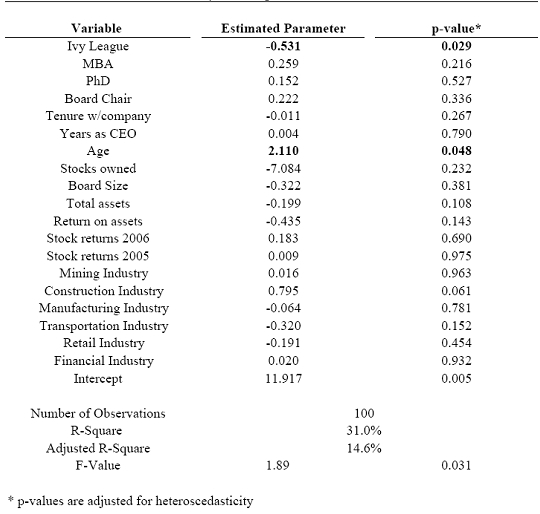 Thus, my univariate analysis in Tables 1 and 2 suggests that CEO compensation is actually lower for CEOs with a degree from an Ivy League institution. However, because this analysis does not control for other factors already shown to influence CEO compensation, I will next use ordinary least squares to more rigorously test my hypothesis. 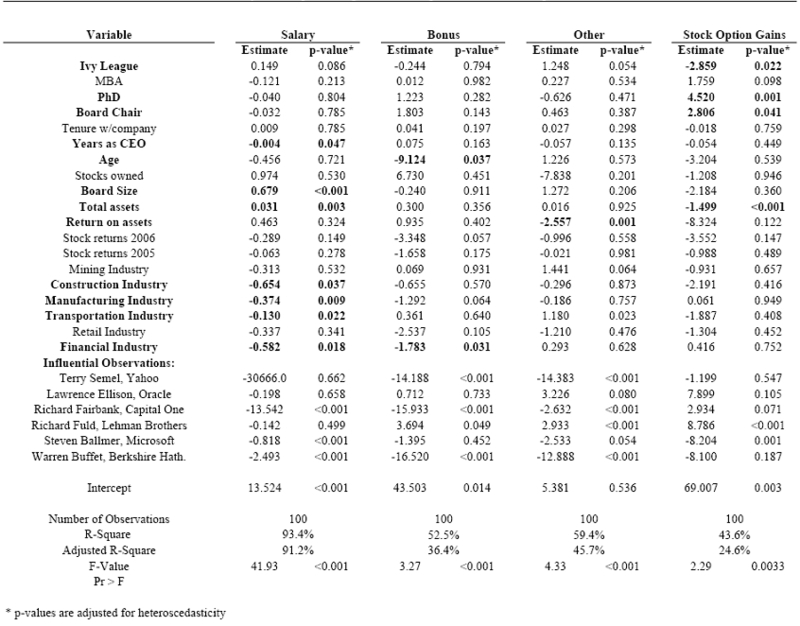 Table 3 shows an OLS regression that controls for education level, industry, and other factors. The p-values shown are adjusted for heteroscedasticity. Surprisingly, results from Table 3 continue to show that an Ivy League education is significantly associated with lower compensation (-0.531, p=0.03), even after controlling for other factors. However, this counter-intuitive result may be driven by a few influential, outlying observations (especially because of the limited size of my dataset). To ensure that a few outliers are not “driving” my results, I check for influential observations and single them out using dummy variables, so that their effects do not distort my analysis. These results are shown in Table 4. I identify six outliers in Table 4 using dummy variables. These outliers represent CEOs who are paid significantly more or less than the majority of CEOs in my dataset, after controlling for other factors. Extreme positive observations are Terry Semel at Yahoo, Lawrence Ellison at Oracle, Richard Fairbank at Capital One, and Richard Fuld at Lehman Brothers. Extreme negative observations are Steven Ballmer at Microsoft and Warren Buffet at Berkshire Hathaway. Buffet, for example, has an Ivy League education (an MBA from Columbia), but has total compensation of merely $100,000 (or about 0.3% of the average compensation for all CEOs in my dataset). The separation of these outliers yields a more accurate portrayal of the overall relationship between an Ivy League education and compensation. 2 In Table 3, Ivy League education is strongly correlated with total compensation (-0.53, p=0.029). But when outliers are controlled for in Table 4, the association between Ivy League education and total compensation is insignificant (-0.11, p=0.39). Therefore, my hypothesis is not supported and I am unable to show that having an Ivy League education is associated with higher total compensation. However, my examination of total compensation may be confounded by a more complex relationship between education and the components of compensation. Therefore, I next break compensation into four component parts (salary, bonus, “other”, and stock option gains), in Table 5. As with Tables 3 and 4, the p-values in Table 5 are adjusted for heterscedasticity. Ivy League education is positively associated with salary (+0.15, p=0.086) and other compensation (+1.25, p=0.054), but the relationship is marginal for both. In contrast, Ivy League education is negatively associated with stock option gains (p=-2.86, p=0.022). Thus, it appears that the lack of a relationship between Ivy and compensation in Table 4 is driven by a positive association for salary and “other” that is counteracted by a negative relationship between Ivy and stock option gains. Overall, estimated coefficients on my control variables are consistent with prior research. CEOs who are also board chairs earn significantly higher compensation, as do older (and presumably more experienced) CEOs. Somewhat surprisingly, total assets are negatively associated with total compensation; however, when I analyze the components of total income separately, I find that total assets are positively associated with salary (consistent with prior work), but negatively associated with stock option gains. Interestingly, tenure with the company appears to be negatively associated with total compensation. This is likely because I have already controlled for CEO experience with CEO age; after controlling for CEO experience, CEOs that have “come up through the ranks” of the firm (as opposed to being hired in from outside) appear to receive less compensation. I also find that CEO compensation (in aggregate and broken out into components) is not associated with stock returns or returns on assets. This seems to support some recent complaints that CEOs appear to be richly rewarded regardless of their performance. Finally, firms in the construction industry appear to remunerate their CEOs more richly than other industries (again, this appears to be mostly driven by stock option gains). Firms in the transportation industry, in contrast, are stingier in compensating their CEOs. This paper investigates the relationship between CEO compensation and having a degree from an Ivy League institution. Contrary to my hypothesis, an Ivy League education does not equate to higher total compensation. However, my results also show that CEOs with an Ivy League education earn more salary and “other” compensation than non-Ivy League CEOs. This positive association is overshadowed by the significantly negative relationship between Ivy and compensation from stock options exercised during the year. One limitation of my study is that it focuses only on 2006 CEO compensation for a small sample of firms. After years of undesirable attention on CEO compensation, it may be that CEOs are cautious about being perceived as drawing “excessive” compensation. In addition, there have been recent studies that have noted a decline of Ivy League CEOs, which might be an indication of an overall decrease in the value of an Ivy League education. It may be that having a degree from an Ivy League does not provide as much prestige and monetary benefits as noted in past research. However, it may also be that Ivy provides benefits that are not captured in this paper, such as a faster ascent to the position of CEO, or the opportunity to work for a more prestigious company. Ivy-educated CEOs may also be less concerned about monetary compensation and more willing to be compensated by other means, such as an improved lifestyle (or other perks not captured in my measure of total compensation). This investigation contributes to the ongoing debate surrounding CEO compensation. Unlike past research, I have narrowed this exploration to assess the relationship between Ivy League education and CEO compensation. In addition, the findings from this research serve as a platform for future research to focus on different dimensions of CEOs and their compensation. Further investigation could focus on sampling more than 100 companies. Also, other factors such as gender differences and race distinctions are areas that remain relatively unexplored. My investigation does not include any of these variables because the sample size was too small to measure the effects of race or gender. There was only one female CEO and two African American CEOs within my sample. Michael Sampson-Akpuru is a junior at Kelley School of Business at Indiana University. He was born in Enugu, Nigeria. In 2000, he immigrated to the United States with ten of his older siblings. His late father was a Chemical Engineer and his mother is a teacher. He majored in Biology at Indiana University-Northwest. In 2009, he will be graduating with a BS in Finance/Real Estate. I would like to acknowledge and thank the McNair Scholars Program that for the opportunity and support to conduct this research. Also, I want to thank my mentor, Dr. Derek Oler, for his guidance and insight. I also want to thank Cathi Eagan, Jennifer Flynn and Deb Englert for their efforts in coordinating the McNair summer research program. 1. Stock option gains are the value realized by exercising stock options. 2 "Other" compensation is an aggregate of vested restricted stock grants; long term incentive plans payouts and perks. 2. Results are very similar if I simply delete these outlying observations. Belsley, D.A., Kuh, E., and Welsch, R.E (1980). Regression Diagnostics, New York: John Wiley & Sons, Inc. Core J. E, Thomas R.S. (2005). Is U.S CEO Compensation Broken? Vanderbilt University Law School and Economics, 17, 97-104. D'Aveni, R., (1989). Dependability and organizational bankruptcy: an application of agency and prospect theory. Management Science, 35, 1120-1138. D'Aveni, R., and Idalene K., (1993). Top Managerial Prestige, Power and Tender Offer Response: A Study of Elite Social Networks and Target Firm Cooperation during Takeovers. Organizational Science, 4, 123-151. Duboff, J., Katz D. ‘Few CEOs are Ivy League Grads' Yale Daily News. 7 July 2007. Finkelstein S., Hambrick H.C. Strategic Leadership: Top Executives and Their Effects on Organizaitons. New York: West Publishing Company, 1996. Finkelstein, S. (1992). Power in Top Management Teams: Dimensions, Measurement, and Validation. The Academy of Management Journal, 35, 505-538. Geneen, H.S. ‘Why directors can't protect shareholders', Fortune, 17 September 1984, pp. 28-32. Gomez-Mejia LR, Balkin DB. (1992). Compensation, Organizational Strategy, and Firm Performance. Cincinnati: South-Western Publishing Co.
Gomez-Mejia LR, Welbourne TM. (1989). Strategic Design of Executive Compensation Programs. In Gomez-Mejia LR, Olsen R, Milkovich GT (Eds. ), Compensation and benefits (pp. 216-269). Washington: Bureau of National Affairs. Judge T.A., Cable D.M., Boudreau, J.W., Bretz. R.D. (1995). An Empirical Investigation of the Predictors of Executive Career Success. Personnel Psychology, 48, 485-519. Judge TA, Bretz RD. (1994). Political Influence Behavior and Career Success. Journal of Management, 20, 43-65. Kerr JL, Bettis RA. (1987). Boards of Directors, Top Management Compensation and Shareholder returns. Academy of Management Journal, 30, 745-764. Miller, Janice, and Robert Wiseman (2001). Perceptions of Executive Pay; Does Pay Enhance a Leader's Aura? Journal of Organizational Behavior, 22, 703-711. Murphy K.J. (1985). Corporate performance and managerial remuneration. Journal of Accounting and Statistics, 7, 11-42. Oler D., Bradley O., Skousen C. (2007). CEO Power, Governance and Acquisitions. Working paper, Indiana University. Pearce J.A,, Zahra S.A. (1991). The Relative Power of CEOs and Boards of Directors: Association with Corporate Performance. Strategic Management Journal, 12, 135-153. Pfeffer J. (1991). Organizational Theory and Structural Perspectives on Management. Journal of Management, 17, 789-803. Rajagopalan N., Prescott J.E. (1990). Determinant of Top Management Compensation: Explaining the impact of Economic, Behavioral, and Strategic Constructs and the Moderating Effects of Industry, 16, 515-538. Useem, M. (1980). Corporations and the Corporate Elite. Annual Review, 6, 41-77. Useem, M. (1979). The Social Organization of the American Business Elite and Participation of Corporation Directors in the Governance of American Institutions. American Sociological Review, 44, 553-572. Useem M., Karabel J. (1986). Pathways to Top Corporate Management. American Sociological Review, 51, 184-200. Wan, K. (2004). Managerial Compensation when Mangers are Principals. Corporate Ownership and Control, 1, 106-212. Whitely W., Dougherty T.W., Dreher G.F. (1991). Relationship of Career Mentoring and Socioeconomic Origin to Managers' and Professionals' Early Career Progress. Academy of Management Journal, 34, 331-351.